Do you usually drink wine? Do you want to drink a batter taste wine when picnic or business travel? Do you want to drink a batter taste wine without waiting? Our Wine Aerator is a good choice for you! It's packaged in a classy gift box, making it that perfect gift for any occasion. There are two slight fold lines that extend upward from each air hole. These are normal. During manufacturing, material folds around rods and wraps back, and this causes the fold lines. Improve Taste without Waiting-- Our wine aerator pourer has a large aerating chamber and air intake system to infuse your wine with the optimal amount of oxygen.This is a good choose for people that want a smoother better wine tasting experience quickly with ease and convenience. 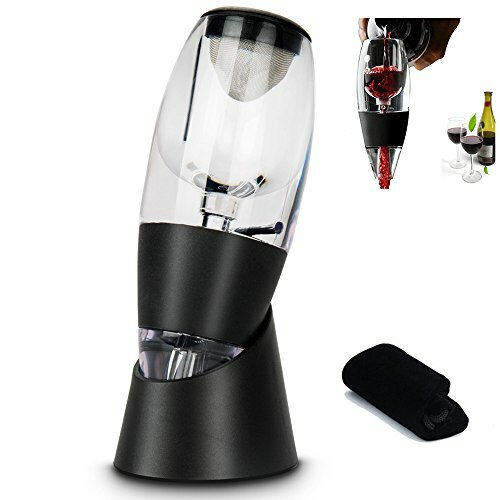 Easy to Use and Clean-- Aerator incorporates the proper amount of air into the wine in just the right amount of time.Unique design makes the wine aerator pourer easy to disassemble and use. The aerator can be run under water for effortless cleaning. Carry to Anywhere You Want-- The portable size, you can carry it with you. Best kitchen tool for home use, house party, picnics, travel, business trip, also best gift for wine lover. FDA approved and food safe-- Our wine aerator pourer made of high quality acrylic and comes with a no-drip stand, carrying pouch and filter. GUARANTEE-- If you have any issue with our products, please feel free to contact us, we will do our best to find a satisfactory solution for you within 24 hours. If you have any questions about this product by Bche Shopping, contact us by completing and submitting the form below. If you are looking for a specif part number, please include it with your message.